Originally, today's Nintendo Direct was scheduled for September 6, but it was delayed in respect for the victims of the 6.7 magnitude earthquake that shook Hokkaido, Japan. The Direct being delayed led to a lot of premature reveals, such as Final Fantasy XV: Pocket Edition on consoles and Civilization 6 on Switch. There were still plenty of surprises in today's presentation though. Nintendo kicked off this week's Direct with a short, surprising teaser. Luigi's Mansion 3 is in development for Switch, and it's coming in 2019. More details will come in the future, but it's nice to see Luigi in a creepy mansion with his handy vacuum again. The Nintendo 3DS remake for the original Luigi's Mansion will also be out on October 12. Kirby's Extra Epic Yarn, the Wii game, is coming to Nintendo 3DS. It'll also have some new features, like new items. It's launching in 2019. Mario and Luigi: Bowser's Inside Story + Bowser Jr.'s Journey, the very iterated upon portable RPG series, gives Bowser Jr. his own story. It will be out on January 11, 2019. Splatoon 2's 4.0 update got a new trailer, showing off a new map, sub weapons, and what sure looks like a battle royale mode. It turns out, the 100x is not a battle royale mode, but new rules and modes for the Splatfest, as detailed in the Squid Research Lab blog. A new song was also featured in the trailer, tipping towards additional music being added to match rotation. Version 2.0 update for Mario Tennis Aces is also on the horizon. Petey Piranha is the next character in the line-up to join the court, which makes me wonder if more bosses across Mario Tennis Aces' campaign will be revealed in the future. A new co-op mode where you play limited time missions with other players is also coming to the free update, which unlock new colors for characters. (Finally.) Version 2.0 launches on September 19, and more characters are on the way, such as Shy Guy, in the future. The Capcom Beat 'Em Up Bundle is a collection of seven games, two of which have never been on console before. The bundle features Final Fight, Captain Commando, The King of Dragons, Knights of the Round and Warriors of Fate, Armored Warriors and Battle Circuit—the last two the aforementioned newbies to console life. English and Japanese versions will be available, in addition to online multiplayer, art galleries, and more. The collection launches September 18, 2018 on Switch for $19.99. New Super Mario Bros. U, the underrated Wii U platformer, is coming to Nintendo Switch next year with New Super Mario Bros. U: Deluxe. Nabbit and Toadette are two new characters to join the already existing roster, and Toadette can turn into "Peachette" if she grabs a "Super Crown." The Switch release will also come with New Super Luigi U as well. New Super Mario Bros. U: Deluxe releases on January 11, 2019. 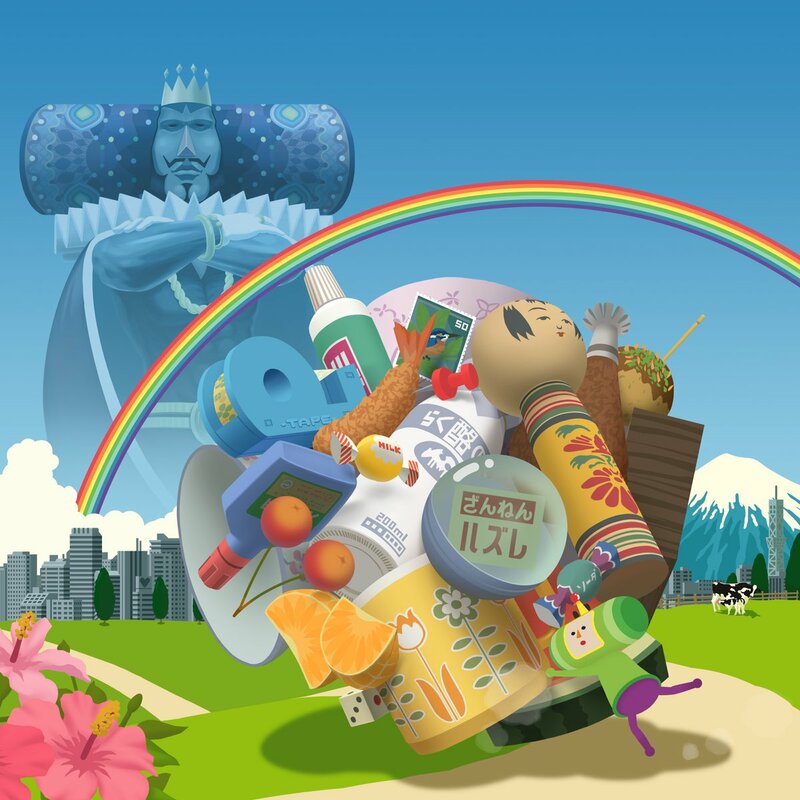 Katamari Damacy Reroll is a remaster of the PlayStation 2 classic. It'll feature HD Rumble, Gyro Controls, and more. (The gyro controls in particular sound great.) It looks great in HD on the Switch too. If you're already humming "Cherry Blossom Color Season" in your head like I am, at least we won't have to wait long to roll up some stars, as it launches in winter 2018. Classic NES games, online play, and more is included in Nintendo Switch Online. So if you were excited for that new Splatoon 2 update, get ready to pay up. Ice Hockey, Pro Wrestling, and The Legend of Zelda are just some of the 20 NES games available to play at the platform's launch. It will also feature cloud saving and "special offers," though nothing was announced on that front. Nintendo Switch Online launches next week on September 18. If you want to play the NES games that come with Nintendo Switch Online as intended, then you can get the new NES-replica controllers. The NES-like controllers are wireless, and can charge when your Switch is docked where you slide your Joy-Cons in. Unfortunately, you will need a Nintendo Switch Online account to buy them, somehow. They cost $59.99. Pokemon: Let's Go Pikachu and Eevee is releasing on November 16, alongside the Poke Ball Plus and a limited edition Switch with yellow and beige Joy-Cons. Diablo 3 is also on the way, as the Blizzard RPG is releasing on November 2. Super Mario Party, the latest in the long-running friendship ruining series, is out in just a few weeks on October 5. The super cool mech game from some of the developers behind Armored Core and the designer behind Macross, Daemon X Machina, got some new details on its customization today. The slick-looking mech action will be out in 2019. In some blink and you'll miss it moments, Nintendo also highlighted NBA 2K19, NBA 2K Playgrounds 2, Just Dance 2019, FIFA 19, Team Sonic Racing, and LEGO DC Super-Villains. Warframe, which we already knew was coming to Switch, finally got a release date too: it's coming November 20. We got another peek at the exclusive content coming to Starlink: Battle for Atlas when it releases on October 16. And it's not just Star Fox making an appearance in the Switch edition, he's getting his own missions too. The new trailer for it today also teases Wolf. Nintendo also showed short trailer was reminding fans of the impending releases of two RPGs: The World Ends with You: Final Remix (out October 12) and Xenoblade Chronicles 2: Torna ~ The Golden Country (out September 21, or September 14 for season pass holders). That wasn't all on the RPG front though. There's a lot of Final Fantasy coming to Switch. (It's about time!) Final Fantasy Crystal Chronicles Remastered, which was previously announced last week, got some new details. On Switch, it will feature online multiplayer and is aiming for a 2019 release. Final Fantasy XV: Pocket Edition HD, which released on PS4 and Xbox One last week, is out today on Switch—notably it's the only version of Final Fantasy XV available on the console. In addition, Nintendo announced World of Final Fantasy Maxima, the very fan service-y and cute mash-up RPG (the original version released in 2016). It's coming to the console on November 6. Chocobo's Mystery Dungeon Everybody, a revisit to the 2007 game Final Fantasy Fables: Chocobo's Dungeon, will release this winter. In 2019, Final Fantasy XII: The Zodiac Age, Final Fantasy VII, Final Fantasy IX, and Final Fantasy X and X-2 are coming to Switch. Sorry Final Fantasy VIII! Cities Skylines, the hit city simulator from Paradox Interactive, is available on Switch today. The trailer shown highlighted some questionable frame rate, but its expansions After Dark and Snowfall will be included in the Switch version. That wasn't it for the PC-centric hits coming to the portable console: Sid Meier's Civilization 6, the turn-based strategy game, is also on the way to Nintendo Switch on November 16. It'll feature something new too: four-player "LAN" multiplayer. Town is a new RPG from Game Freak, the creators of Pokemon. The entire game takes place in a single village. It looks pretty cute, to be honest. Town's still a working title, but it'll be available in 2019. Yoshi's Crafted World, the once-untitled Yoshi game, has been revealed. It continues the Kirby and Yoshi trend of letting Yoshi play around in a hand-crafted world made of cardboard and yarn and other crafty materials. You can play levels backwards too, and mess with perspectives to reveal secrets. It's aiming for release in spring 2019. Tabletop games are coming to Switch thanks to Asmodee. Carcassonne, The Lord of the Rings: The Living Card Game, Pandemic were unveiled today, and will start to release this December. More titles are also en route, in addition to those revealed today, including the classic Catan and Munchkin. Tabletop games will likely feel right at home on Switch. The specially-designed Super Smash Bros. Ultimate Switch has some great art etched into its dock. The Joy-Cons also have the iconic Smash cross on them, but no crazy colors. It launches November 2, alongside the GameCube controller and adaptor. Animal Crossing is in-development for Switch! JUST KIDDING. Isabelle's gonna be in Super Smash Bros. Ultimate. That teaser trailer of Isabelle in the mayor's office sure had us going, didn't it? And then it turned out to actually be true. After Isabelle's reveal, Tom Nook was shown in his office, contemplating getting the town ready with all the "smashing and camping" villagers have been doing. Then it's revealed that a new mainline Animal Crossing game will be coming in 2019 to Nintendo Switch, six years after the Nintendo 3DS entry Animal Crossing: New Leaf. At last, I can be in perpetual debt again. My lifelong dream. For everything we know about Nintendo's upcoming Animal Crossing game for Switch, head over to our Animal Crossing Switch guide. Tagged with Animal Crossing,	Luigi's Mansion,	News,	Nintendo,	Nintendo 3DS,	Nintendo Direct,	Nintendo Switch.